NZ's hardest working band, The Eastern, have been roaring around the music scene for ten years and with four albums and well over 1000 shows under their belt, they have no plans on stopping soon! Best known for their 2012 record, Hope and Wire a bold double album that reached Gold Status, climbed to #2 in the NZ Charts and debuted at #1 on the NZ iTunes chart. 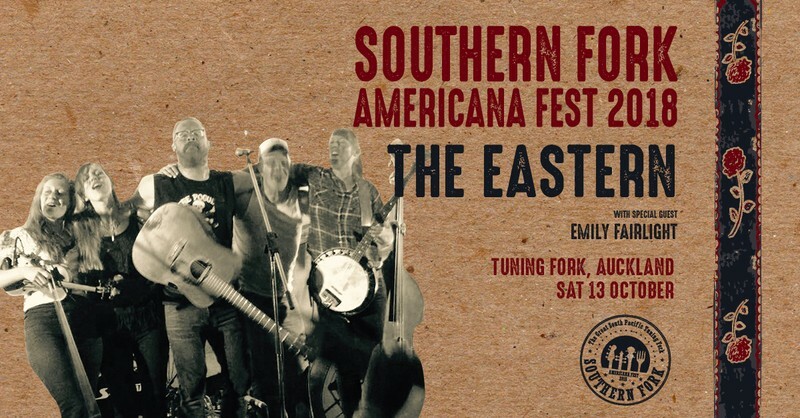 They have played and toured with Fleetwood Mac, Steve Earle and Old Crow Medicine Show amongst others and manage to tick off 200 shows a year every year! No Depression mag described the band as "One of the most modern roots acts from any country" and Radio NZ and NZ Herald hailed them as "National Treasures." NZ Country legend Barry Saunders simply called them "The truth." Wellington based indie-folk songstress, Emily Fairlight has been composing and performing for over a decade, carting around her introspective alt/folk through New Zealand, Australia and the USA. She recorded her sophomore album, Mother Of Gloom, with Doug Walseth of The Cat's Eye Studio in Austin, Texas. Second Hand News described the album as "deft and exquisite, drawing you completely into Fairlight's stories," and Radio New Zealand praised the songs for distilling "moments of emotional turmoil into palpable images anyone can feel."